Fran passed away in 2001 at the age of 82 and her husband died two years latter at the age of 84. They touched and inspired so many people, not just here around the Bay but throughout Orange County where they are considered the parents of the conservation movement. They showed by example how much concerned and dedicated citizens could achieve. Orange County was probably growing more rapidly than any other area in the country after the Second World War. The population grew from 216,000 in 1950 to 704,000 in 1960 and 1,420,000 in 1970. With this came a demand for homes and recreational opportunities to satisfy the increasing affluence of a large portion of this population. The number of boats in the county, for example, rose from 14,000 in 1960 to 34,000 in 1970. The Lower Newport Bay has been pretty thoroughly developed as a channeled, residential pleasure boat harbor, and pressure was growing for expansion of that kind of development into the Upper Bay. Housing and other forms of urban development encroached upon the bluffs and uplands to the east and west, while water skiing and other boating activities increased in the Upper Bay and marine-oriented projects such as the Dunes Aquatic Park and Dover Shores started up the lower end of the Upper Bay. 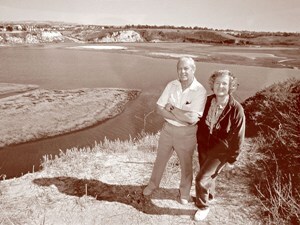 Earlier efforts to create a harbor in the Upper Bay had been frustrated partly by the pattern of land ownership there, a portion of which was public and the balance of which was claimed by The Irvine Company. During the 1950’s new plans were prepared and during the 1960’s a land exchange was worked out between The Irvine Company and the Orange County Board of Supervisors. Considerable debate ensued as to the fairness and legality of the land trade. In 1963 a small group of local citizens led by Fran and Francis Robinson challenged the constitutionality of the trade in court. It took ten years for the proposed land trade to be declared unconstitutional. During this period public awareness of environmental issues was increasing. This increasing awareness led to the National Environmental Policy Act of 1969, the California Environmental Quality Act of 1970 and other environmental legislation. In 1967 the Robinsons and others founded Friends of Newport Bay (one of our predecessor organizations) to educate the public and enlist support for the preservation cause. As a result, the environmental impact of the proposed development of UNB was also questioned. Thus, not only was the land swap prevented, but most of the Upper Bay was acquired in 1975 by the State of California for a wildlife reserve.